Habitat: Shallow reefs and marine channels. Diet: Mollusks and crustaceans, especially shrimp and crab. Cuttlefish, along with octopuses and squid, are cephalopods—animals from an ancient branch of the tree of life that have been trolling the oceans for more than 500 million years. Cuttlefish were around long before the first shark or fish ever evolved. Their cephalopod ancestors were encased in a shell that acted as protection from predators, but the modern cuttlefish has developed an even better defense: camouflage. A cuttlefish’s skin contains over twenty million chromatophores, cells of pigment attached to miniscule muscles. By gently flexing these muscles, the cuttlefish releases pigment into the outer layer of its skin, allowing it to control its coloration and body pattern to emulate virtually any surroundings and thereby hide in plain sight. The cuttlefish’s highly specialized skin also helps it hunt, communicate, and mate. Males aggressively ripple and flash at rival males in competition for access to females. The larger and more impressive male usually wins, but sometimes a smaller male can successfully mate via female impersonation; if a small male can grab a female and quickly disguise himself to look like her, the larger male may not notice the two are mating. Each cuttlefish has a pair of undulating fins that span the length of their body and help the creature to swim and maneuver; for any quick movements, it propels itself by shooting water from its gut. 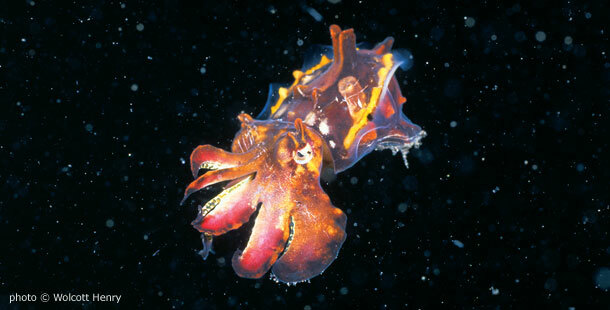 In the middle of eight forward-reaching tentacles, there is a small beak, which cuttlefish use to break open the shells of mollusks, crabs, and other crustaceans. Cuttlefish also have two longer tentacles, with a single suction cup at each tip. They use these elongated arms to grab their prey. Cuttlefish have a short life span, but they grow quickly. They may only live one or two years, but some species can grow up to about 23 lbs (10.5 kg). Since they have such fast growth rates, cuttlefish are careful not to expend too much energy and usually spend about 95 percent of their time resting. Cuttlefish also have an internal structure called a cuttlebone that allows them to conserve energy by helping to keep them buoyant. The cuttlebone is a long, oval bone filled either with gas or liquid, depending on the time of day and cuttlefish’s desired buoyancy. These bones wash up on shore when cuttlefish die, and they are collected by people and sold as a calcium supplement treat for domesticated birds. Cuttlefish produce a brownish ink, which they squirt to confuse predators when threatened. Humans have long used this ink in art, and the color name sepia takes its origin from the cuttlefish species name, Sepia officinalis. Cuttlefish generally live in shallow reefs, but they can also live in channels and deeper waters up to 650 ft (about 200 m). They are distributed around the globe, and over 120 unique cuttlefish species have been discovered. New species continue to be identified, and while no cuttlefish species is currently endangered, increased fishing by humans could become a threat. Did you know: Cephalopods are considered one of the most intelligent animals in the sea, and their cognitive abilities have been widely studied. Social learning in cuttlefish has been documented, and cuttlefish have even been trained in a lab to swim through T-shaped mazes.